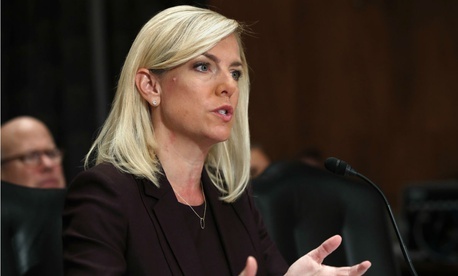 President Trump’s pick to lead the Homeland Security Department promised at a confirmation hearing Wednesday to give new directives to employees regarding immigration enforcement priorities and vowed to reform the department’s hiring and training efforts. Kirstjen Nielsen would place hiring and retention reform “at the top of my priority list,” the secretary designee told the Senate Homeland Security and Governmental Affairs Committee. She called for the department to modernize its personnel processes, and vowed to couple accountability with rewards for good work. Nielsen pledged to solicit feedback from front line and field employees and to build a pipeline so the concerns of all workers are addressed. Nielsen formerly headed the offices of Legislative Policy and Government Affairs at the Transportation Security Administration before serving as former Homeland Security Secretary John Kelly’s chief of staff. She is the first person with experience as a DHS employee to be selected to head up the department. Nielsen followed Kelly to the White House, where he serves as chief of staff and she as his principal deputy. She said she would use that experience to improve morale and streamline inefficiencies at the department. On Tuesday, Nielsen agreed the Obama-era priorities of deporting violent and other serious criminals should be the top priority. The Trump administration has frequently cited Obama policies, such as directives on whom to prioritize and when to make arrests, as overly restrictive. Such restrictions hurt employee morale and put the nation’s security at risk, administration officials have said. Nielsen told Sen. Kamala Harris, D-Calif., she would issue directives to Immigration and Customs Enforcement employees not to prioritize the deportation of individuals with Deferred Action for Childhood Arrivals status or other so-called DREAMers. That sentiment differs from the one acting ICE Director Thomas Homan delivered before Congress in June, when he said all undocumented immigrants are now vulnerable to arrest and deportation by virtue of their immigration-related violations alone. A DHS spokesman said there was no contradiction between the existing administration policy and the ideas Nielsen expressed. He said any new directives would simply reiterate the priority of arresting and deporting criminal aliens “who pose a risk to public safety” or those facing a final judicial order of removal. Also as part of Trump’s immigration executive orders, the department is looking to hire more than 15,000 new ICE and Border Patrol employees. Nielsen, in a prepared questionnaire provided to the committee, pledged to work with the Office of Management and Budget and the Office of Personnel Management, as well as internal leadership, to come up with “creative solutions” to ongoing hiring and retention challenges. DHS is currently experimenting with a new polygraph exam for Border Patrol applicants and using special pay incentives for hard-to-fill positions. She said she had already started to improve personnel practices and eliminate waste. “I will continue the efforts I started while serving as the chief of staff regarding streamlining human capital processes, improving the morale at all levels, ensuring clarity at all levels with respect to the DHS mission and priorities and working with Congress to redirect or eliminate non-mission critical work,” Nielsen said. Reflecting on her management style, Nielsen said she values dissenting opinions and would listen to all types of feedback. Nielsen promised to create a safe environment for whistleblowers and to generally listen to employees so she can provide them will all the “support, tools and resources” they need to do their jobs. She pledged, if confirmed, to report back to the committee within three months on steps she has taken to boost training and improve communications with department personnel. While Nielsen won praise from Democrats for her softer tone on immigration and promises to support rank-and-file employees, she irked members of the minority party with her answer on climate change. While she believed the climate is changing, Nielsen said she was “not prepared to determine causation.” She said she would, if confirmed, further examine the science.